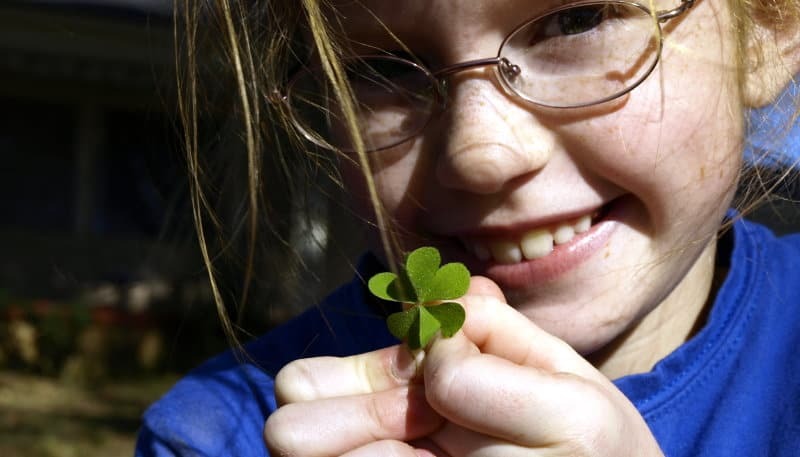 “Am I lucky?” That’s a question you may hear this St. Patrick’s Day from a wide-eyed child in your children’s ministry. In the community and on television, there will be lots of talk about leprechauns, finding a four-leaf clover or even a pot of gold at the end of a rainbow. The idea of a sudden change in fortune or receiving a windfall of wealth is an attractive idea to people of all ages–including kids. I’m sure it’s all meaningless, silly fun but what an opportunity to teach kids about the power of God’s blessings. For example, if you find a penny on the sidewalk, this is a happy event that brought you a small amount of increase but was it luck or a blessing? Proverbs 16:33 says,“The lot is cast into the lap, But its every decision is from the Lord.” I believe that from our earthly perspective, fortunate occurrences can seem random, but throughout the Bible, God clearly is in control of everything is able to use seemingly “random” acts of natural law, our free will (of good and bad men) and even the evil plots of demons (read Job) to accomplish His good and perfect will. In other words, everything good we receive into our lives, unexpected or expected is a result of God’s blessing, whether passive or active. I know what you’re thinking. Whoa! That’s kind of heavy to teach kids. Yes and no! Let’s use this object lesson to get kids thinking about the truth of God’s blessings. It’s natural to feel “lucky” when something awesome happens like you win a raffle or you get picked first for a game or a treat. However, the Bible says that every decision comes from the Lord. That means when something good happens to people, God arranged for it to happen. So next time you search for a four-leaf clover–and find one or the next time something good happens to you, remember luck didn’t bring it. Good things always come from God! Tony Kummer (Editor) reviewed & updated this page on : March 10, 2014 at 8:26 am. All our content is peer reviewed by our readers, simply leave a comment on any post suggest an update.